It is great to be back to the lively, festive summertime streets of St. Petersburg, Russia. The weather is warm, and we are enjoying the atmosphere of the “White Nights”  we are at 60 degrees north and the days around the summer solstice are long. At 11:00 PM in the evening; it is still light and the streets are full of relaxed and happy people strolling and enjoying the summertime air. This morning the first three members of our team, Steve and Mike Shuel and I met up in the lobby just as Lina, the Berg Adventures St. Petersburg city tour guide arrived. I had not seen Lina since last year and as always her engaging warm smile was a welcome sight. We are staying on Nevsky Prospect, the “main street” of St. Petersburg and as far as culture, history and art it is the main street of Russia in my opinion. The three of us set out walking down the street without a care early this morning. We got some shopping done and we stopped at the Kazan Catherdal and listened to the resonate voices of the Russian Orthodox priest praying with the beautiful voices of the choir in the background. We walked by the Church of the Spilled Blood and St Issac’s Catheral, both of which we will visit day after tomorrow with the rest of the group. 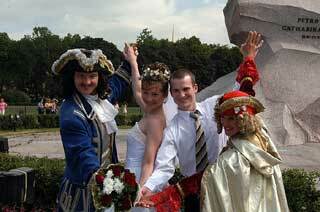 At the statue of the Bronze Horseman, we saw a number of happy wedding parties. 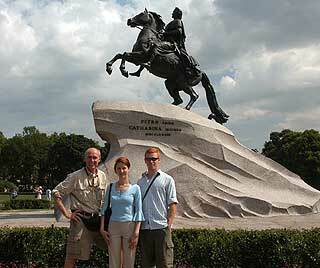 It seems that every couple from St. Petersburg who gets married comes to the Bronze Horseman to celebrate and have their photos taken. On this Friday afternoon we saw 5 different couples preparing to take their vows. Lina managed to get three seats tonight at the Marisky Theater for us to see a performance of Swan Lake. As Steve says, a boy from Montana like me should not pass up an opportunity for culture. So as the rest of our team members travel to Russia to join us, Steve, Mike and Wally will be at the Ballet tonight. Tomorrow more of the team will be together and we will report once again from the beautiful and historic city of St. Petersburg.